CoinMasters is an worldwide online numismatic network which focuses on ALL aspects of the "King of All Hobbies", coin collecting! The CoinMasters website is a warehouse for numismatic information contributed freely by our community. 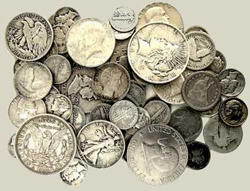 Coin Collectors of all ages worldwide are welcome. As you know, we all face life's challenges. Some of us are better at it than others. As a group, we are better at pulling together and facing those challenges. As more and more potential collectors come online, we will have the challenges of getting to know them, and getting them comfortable with the hobby, online. We may even find common ground, in addition to being collectors. As a service, we are dedicated to educating anyone who is interested in numismatics, from the coin in change, to the more advanced collector. No one can possibly know everything about everything! One could actually spend every waking moment in life thinking about coins, and never learn "all of it" in a lifetime. We are dedicated to sharing knowledge with other collectors. CoinMasters.Net is a place for your entire family to have fun learning about coins, tokens, currency and other numismatic related items. Created by CoinMasters. All rights reserved.